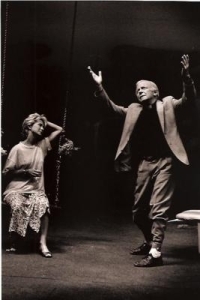 The production moved to the Vaudeville Theatre, London, on 12th June, 1990. “If God existed, or if Simon Gray could invent him, He would be an important character in Hidden Laughter. This is a sad divine comedy, superbly written, and its title is laden with emotion, both comforting and resentful. Gray nurses his characters and cares for them, but he never pampers them, or pities them, or presumes to use them as spokesmen. [T]he final impression is of complicated truths rendered with an unsentimental warmth and something even stranger. The characters don’t just misunderstand each other, suffer pain, and feel guilt: they persistently ask why. To call this Gray’s first metaphysical work might be too much. But his title comes from lines in Eliot’s Four Quartets celebrating the one comfort his play ruefully offers: the indestructible magic of unforgettable moments, for instance with children, in gardens. And that, from a bilious writer, is surely new. 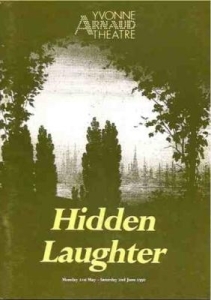 Hidden Laughter was published as a Faber Contemporary Classic in Simon Gray: Plays 4 on July 15th 2010. To order a copy on special offer at 25% discount please contact Faber using code GRAYPLAYS. Or check out the plays section of our bookshop.